Nerja, Spain, 2017, La Playa Calaholda. There is something about seaside cities, something indescribable that makes you want never to leave. It's an energy that supercharges the air and infects the locals with joie de vivre. Having lived in California and New York, I have only found this magical atmosphere in a handful of places. Perhaps, this feeling is simply me trying to recreate a childhood home that I left when I was very little. That place doesn’t exist anymore. Being in Odessa brings this into sharp focus. The city that I love will always be in my heart, but the physical place is always changing. It's useless to want to bring it back. All magical places are a little bit wild, and as wild things go, they can’t truly be yours. Perhaps, that's why we love them so much. The cobblestoned streets are mostly pavement now. This makes me sad, but when my whole body vibrates riding a taxi on a unpaved street, I see the point of getting rid of the cobblestones. Odessa, Ukraine., 2017, The Yellow Stone. The shorelines of my beloved Otrada and Langeron beaches has also changed. Wooden planks cover a broad swath of the shore, replacing the fine sand. A handsome, new statue named The Sun Door stands to face the sea. Looking through the door is like peeking into another world. Above it, the PS1 Hotel boasts panoramic views of sunsets, as yachts that sail up and down the harbor. From the Prosecco Bar balcony, you can see small skiffs and rowboats fishing for the day’s catch. Down a little farther, divers still dive for fresh mussels on the wave breakers (artificial walls build to protect the shoreline from erosion.) It's been this way in seaside cities across the globe. 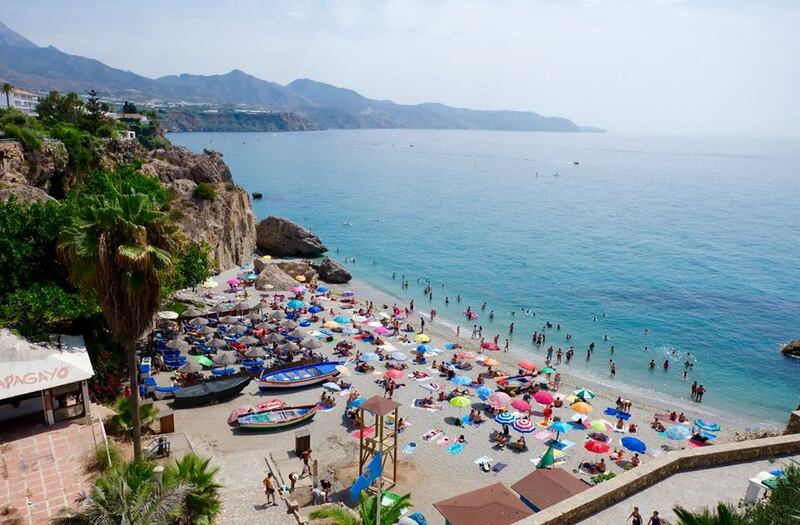 Take Nerja in Spain, a tiny town located an hour outside of Malaga. The beaches are a pure, bright azure with waters that stay warm from sun up to sundown. Large, candy-colored umbrellas line Calahonda and Salon beach as Spaniards judiciously avoid sunburns, unlike the salmon-colored, mostly British tourists. There are several tiny beaches you can get to by wading through the water, and a hidden cave with clear blue waters. The Mediterranean Sea is arguably much more beautiful than the Black Sea. It might be wrong to compare, but objectively, I would say it’s true. Mountains that remind me of California melt into the sea. There are the 2-dollar beers and the free tapas that come with them. I still miss getting a Pulpo Galega or Torta Espanola at 4 p.m., after spending way too much time in the sun. It wasn't home, but now that I am in Odessa I realize that any town where the waves crash on shore will always hold something of a home to me.